How to get there: This mountain is a bit isolated. The normal summer route is likely to start in the village of Fresvik or from the summer road up Jordalen. The road to Jordalen goes north about one kilometer after exiting the Stalheim tunnels on Hwy. E-16 or about 8 km up the valley from Gudvangen. Fresvik is connected to Vik by a road along Sognefjorden (going east from Vik). Vik has a ferry connection (at Vangsnes) from Hella on the north side of Sognefjorden, the connection to Bergen is across Vikafjellet to Voss. This mountain crossing is normally closed at night in the winter (from 2000 to 0800), the road may also be closed if the winter weather turns bad. 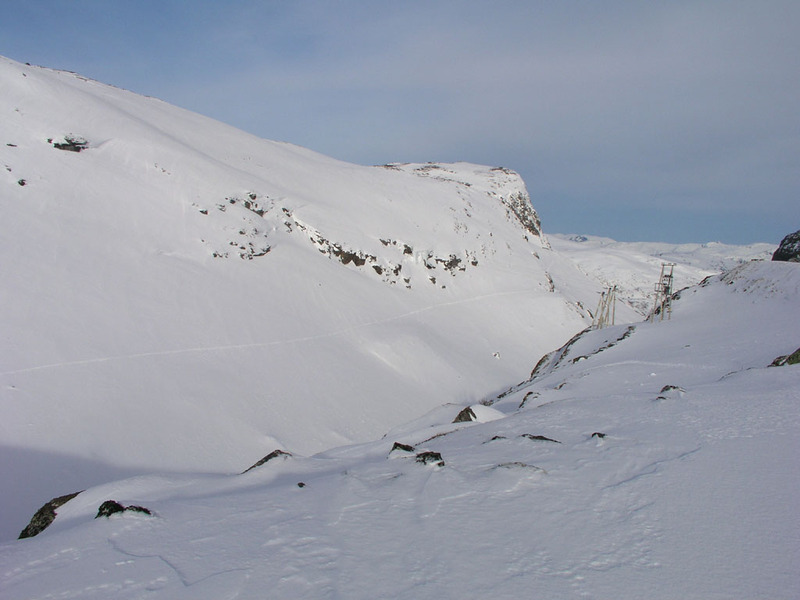 The winter route to be described below starts at the Vikafjellet road. There is a parking area located just south-west (the Voss side) of the bridge where the road crosses the creek from the lake Ovrisvatnet (929m) to the lake Målsetevatnet (834-863m). Route description: There is an old mountain trail connecting the communities of Jordalen with the Fresvik village. 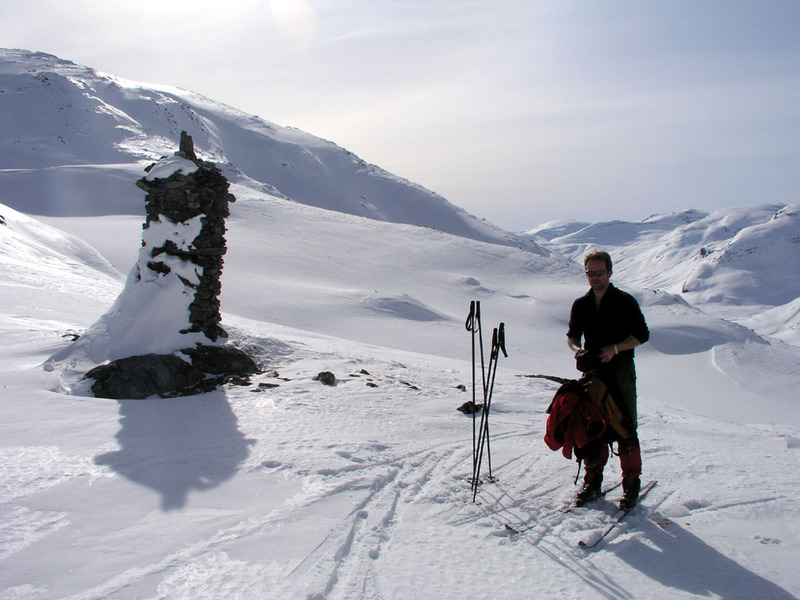 This trail with its well known cairn, Fresvikvarden provides the key to access to Fresvikbreen. In summer, the trail from Fresvik climbs steeply up Tundalen to the lake Langafonnvatnet (1295m). From Jordalen, there is a summer road to Øvstedalen (850m). From here, the trail continues north-east, the cairn Fresvikvarden is clearly visible at about 1200m before this trail also reaches Langafonnvatnet. This lake provides direct access to the glacier in the north. The route to be described here is a winter route starting at the mountain Hwy. across Vikafjellet. As such, it has good and easy connection to Voss and Bergen. The key is to ski across to Øvstedalen, then join the summer route up to Langafonnvatnet (1295m) and finally straight north from this lake to the summit. This is a long and serious ski route of about 45 kilometer with more than 1500 meter of vertical gain. 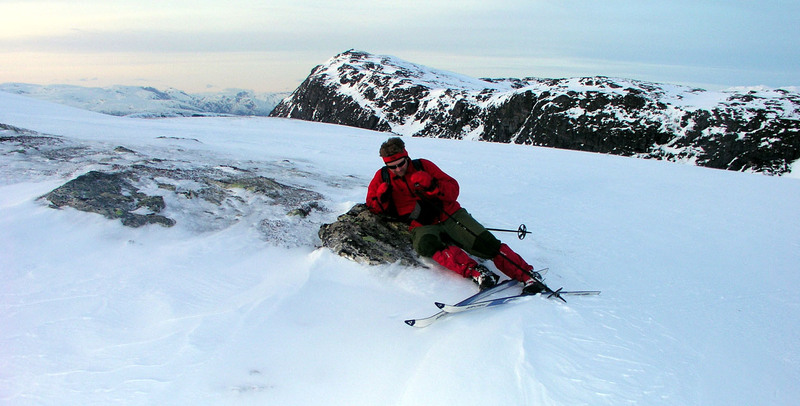 It should only be attempted by experienced, strong skiers under favorable weather conditions. Start out directly east, just north of a power line for the first 2 km, then up on Vetlefjellet (south of Valanipa 1231m). Your first objective is to reach the lake Store Muravatnet east of this mountain. There are two possibilities, straight east across Vossavatnet and more steeply up to the saddle, then steeply down Idlebakken to Muravatnet. 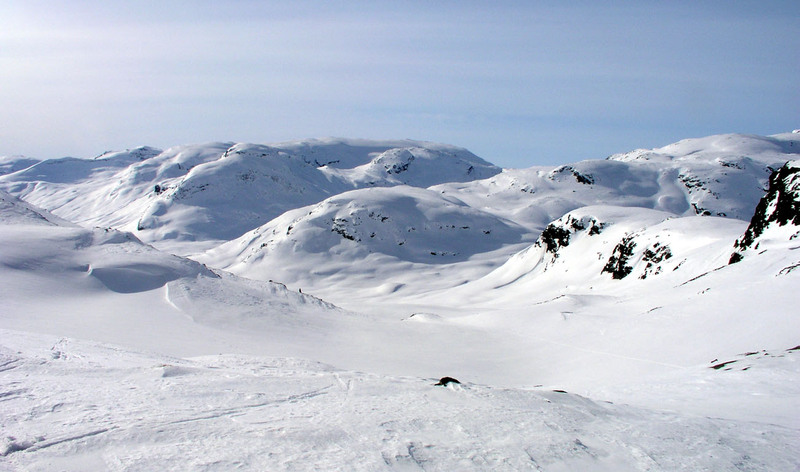 Alternatively, ski north across another small lake and follow the summer road as it enters the very steep Endredalen valley and traverses a steep slope before climbing to Muravatnet. 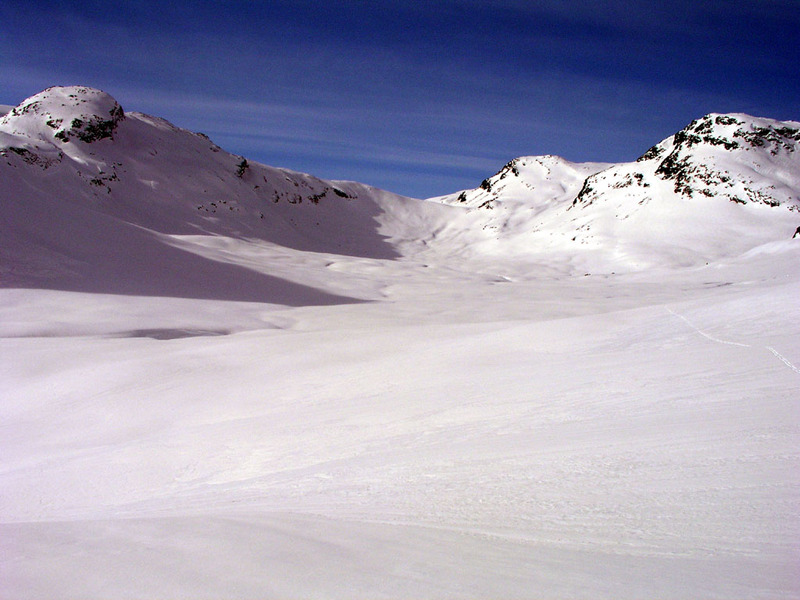 The latter alternative crosses avalanche terrain, carefully consider the snow conditions. Continue south-east across Store Muravatnet and up to Svelgavatnet (1243m). This route climbs north-west of Blåfjellet (1548m). The lake Store Muravatnet is a hydro power reservoir and varies between 1020 and 1060 meter. Pay attention when accessing and leaving the lake. The lake is much smaller than what is indicated on the map when closer to 1020 meter. An added complication is the change of maps as you leave map 1316 IV and enter map 1316 I in this area. Do not confuse the distinct ridge Tverrgavlane with the (on the map) similar feature (marked with point 1161) futher north-west. At the north-east end of Svelgavatnet, the route descends steeply into the valley that will get us to Øvstedalen. Consider the avalanche situation as this slope is facing east and could (potentially) have heavy snow accumulation near the top. (when we made the trip this slope was perfectly safe). There are two cabins further down, keep left (north) of the lowest part of the valley, stay a bit higher than the huts in Øvstedalen and join the trail towards Fresvik near the creek at about 900 meter elevation. Continue across lake 949, and climb into the valley going north-east (Do not go through the pass to north-west). The cairn Fresvikvarden is soon visible towards the sky higher up. The trail is more level before a final, short climb to lake Langafonnvatnet (1295m). From the west end of this lake, pick your way up north, first more steeply, then more gently. Soon, the plateau glacier is fully visible and the climb is gentle. 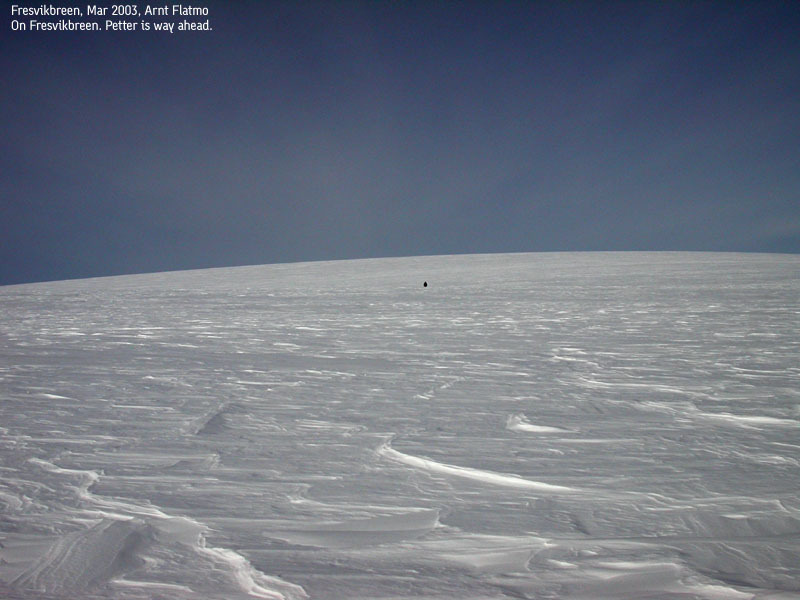 Typically, the slope decreases the higher you get and eventually the summit plateau appears completely flat. Judge the size of the mountains on the horizon to determine the highest point. (This does not work in fog!). Return the same route. Comments: I did this ski tour with my friend Arnt Flatmo. We started at 0830, reached the summit at 1420 and returned to the car at 1900. Since the road opens at 0800 and closes at 2000, this is also close to the maximum time that can be used. My GPS correctly rounded the summit elevation to 1650 meter. We broke trail the entire way, however the snow conditions were quite favorable and we had close to perfect weather. Fresvikbreen, as seen from the Svelga saddle. 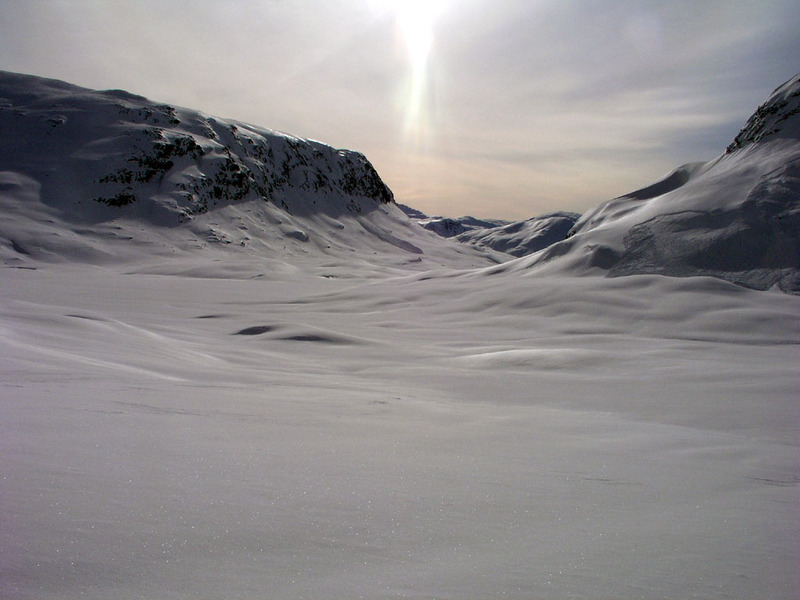 Upper Endredalen, our ski track to Muravatnet. This area may have avalanche problems. The Svelga saddle, as seen from Øvstedalen. The upper part of Jordalen, as seen from Øvstedalen. Looking back, from Fresvikvarden. The second valley to the right is Vikjadalen leading to the Svelga saddle. 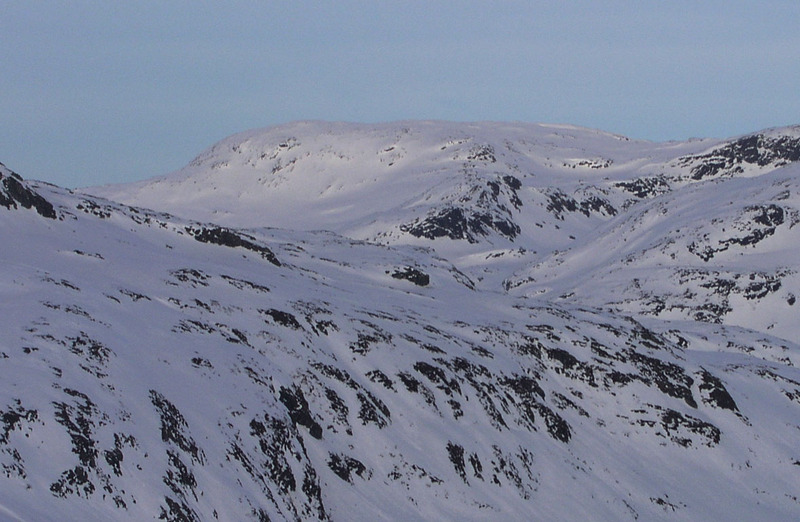 The peak behind this valley is Prestnosi (1366m), in front, while Blåfjellet (1548m) forms the skyline behind. The way ahead, as seen from Fresvikvarden. Fresvikbreen, the final climb can be frustrating. Almost back, Arnt is a bit tired.